I would like to take advantage of this first letter to introduce Horos Asset Management S.G.I.I.C. SA, and the new and exciting project in which I have embarked on, along with Alejandro Martín and Miguel Rodríguez, the managers with whom I have been building a team for years. Horos was born with a long-term vision. Without such, it would be impossible to carry out the value investment philosophy that characterizes us, and, as you know, requires a timeline of several years. The word “horos” was used initially by the Greeks to refer to the boundary where heaven and earth seem to blend together. From it, etymologically came the word “horizon,” and for this reason we could not think of a better word that describes the essence of this project. The celebrated Charlie Munger, a trusted partner of Warren Buffett, advises us that the recipe to achieving satisfactory returns over time and to survive in an industry as competitive as ours requires three basic ingredients: a strong investment philosophy, a good head on one´s shoulders and belonging to an organization that reinforces both. The first two ingredients depend one hundred percent on the equity team. At Horos, we have a proven investment philosophy and process that will allow us to fulfill our primary objective of generating value to our co-investors in the long run. However, getting the third ingredient to the level that we need it may not always be so easy. However, at Horos, we believe a good way to achieve this is with a project where the management team also owns it. We think this is the only way to achieve a true alignment between the style of investment and the management of the organization. That’s why Alejandro, Miguel and I are delighted to become founding partners of Horos. As project partners we have a direct, vested interest in its success. As such, we know that we will all benefit from a stable framework for projects aimed at achieving long-term objectives. Moreover, the three managers are as we have always been in the past: investors of the products we manage. Therefore, we eat what we cook. Horos will also have Qualitas Equity as a founding partner. Qualitas is a private equity enterprise with a proven track record and a prestige that demonstrates its ability to share and understand the needs of a project with this kind of scope. In addition, we will have José María Concejo as CEO and founding partner of the project. José María will bring extensive experience in the industry and his leadership will allow the fund managers to focus entirely on the execution and management of our strategies. Our objective at Horos is to always grow in an orderly and consistent manner. We will do so only when the structure allows it, and only through products that can add value to the investor and that have a consistent investment philosophy. Hence, we will be starting with two investment funds, Horos Value Iberia and Horos Value International, and a third, a pension plan strategy, called Horos International PP. These three products will all exbibit the same investment philosophy with which we have managed previous funds over the last many years. In order to maximize the effectiveness of the operation for the investor, we will utilize Finametrix, the best technological platform in the market. Thanks to the facial recognition system via webcam, all contracts that have single ownership will be able to manage their accounts from the very first minute, without having to deploy any paper sources.  From its inception, Horos will be an asset management firm where the management team is fully aligned with you, the investor. We will pursue the same investment philosophy that has allowed us to achieve very solid results in recent years, which will, as a central objective, generate value for its co-investors. In closing, I can say no more than to welcome you into what I hope will be your home for many years to come, and to thank you wholeheartedly for your trust in this management team.